Caroli disease and Caroli syndrome are rare congenital disorders of the intrahepatic bile ducts. They are both characterized by dilatation of the intrahepatic biliary tree. The term Caroli disease is applied if the disease is limited to ectasia or segmental dilatation of the larger intrahepatic ducts. This form is less common than Caroli syndrome, in which malformations of small bile ducts and congenital hepatic fibrosis are also present. This process can be either diffuse or segmental and may be limited to one lobe of the liver, more commonly the left lobe. Caroli disease is sporadic, whereas Caroli syndrome is generally inherited in an autosomal recessive manner. As with congenital hepatic fibrosis, Caroli syndrome is often associated with autosomal recessive polycystic kidney disease (ARPKD). A rare association with autosomal dominant polycystic kidney disease (ADPKD) has also been reported. See the image below. 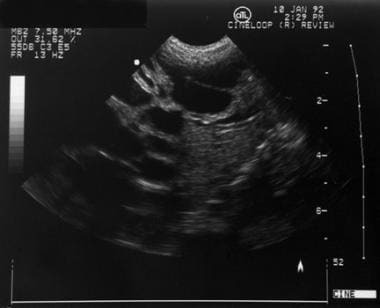 Hepatic ultrasonogram of a neonate with Caroli disease. Multiple dilated intrahepatic bile ducts are present. Courtesy of Richard Bellah, MD, The Children's Hospital of Philadelphia. The precursor of the intrahepatic biliary tree is a sheath of cells surrounding the portal vein branches, known as the ductal plate (DP). The DP first arises from hepatocyte precursors surrounding hilar portal vein vessels at 8 weeks' gestation, and more peripheral regions of the DP develop sequentially. During the remainder of gestation, a process of DP remodeling occurs, during which 1-2 ductules form at points along the circumference of the DP that connect to the intrahepatic biliary tree; the remaining regions of the DP are lost, most likely through apoptosis. Caroli syndrome belongs to a subcategory of diseases thought to originate from DP malformation. In Caroli disease, abnormalities of the bile duct occur at the level of the large intrahepatic ducts (ie, left and right hepatic ducts, segmental ducts), resulting in dilatation and ectasia. Resulting biliary stasis may lead to cholelithiasis, cholangitis, and sepsis, as well as an increased risk of cholangiocarcinoma.  . Because reports have described cases limited to the left lobe of the liver, some have described Caroli disease as either localized or diffuse. In Caroli syndrome, DP malformation is present at the level of the smallest portal tracts and is associated with varying degrees of portal fibrosis. These findings are typical of congenital hepatic fibrosis; therefore, Caroli syndrome is thought to belong in the same spectrum of disease as congenital hepatic fibrosis and ARPKD. Caroli disease and Caroli syndrome are very rare, with an estimated incidence of less than 1 case per 100,000 population. Caroli syndrome (ectasia of the large and small bile ducts with congenital hepatic fibrosis) is more common than Caroli disease (ectasia of only the large bile ducts). Patients with Caroli disease or Caroli syndrome may have recurrent episodes of cholangitis and are also at risk for associated bacteremia and sepsis. Patients with Caroli syndrome or Caroli disease may have cholangitis and may also have complications of portal hypertension as is observed in congenital hepatic fibrosis. Caroli syndrome is associated with ARPKD, and patients may have various degrees of renal cysts, interstitial fibrosis, and renal failure. Both Caroli disease and Caroli syndrome are associated with a risk of cholangiocarcinoma at a rate of 100 times that of the general population. Symptoms of Caroli disease or syndrome are more common in female patients than in male patients. Age at presentation varies and patients may present as neonates or as adults. Cases detected in utero based on ultrasonographic findings have been reported. Nakanuma Y, Harada K, Sato Y, Ikeda H. Recent progress in the etiopathogenesis of pediatric biliary disease, particularly Caroli's disease with congenital hepatic fibrosis and biliary atresia. Histol Histopathol. 2010 Feb. 25 (2):223-35. [Medline]. Wang ZX, Li YG, Wang RL, et al. Clinical classification of Caroli's disease: an analysis of 30 patients. HPB (Oxford). 2015 Mar. 17 (3):278-83. [Medline]. Srinath A, Shneider BL. Congenital Hepatic Fibrosis and Autosomal Recessive Polycystic Kidney Disease. J Pediatr Gastroenterol Nutr. 2012 May. 54(5):580-7. [Medline]. Sato Y, Ren XS, Nakanuma Y. Caroli’s Disease: Current Knowledge of Its Biliary Pathogenesis Obtained from an Orthologous Rat Model. Int J Hepat. July 2012. doi:10.1155/2012/107945. [Medline]. Leelawat K, Sakchinabut S, Narong S, Wannaprasert J. Detection of serum MMP-7 and MMP-9 in cholangiocarcinoma patients: evaluation of diagnostic accuracy. BMC Gastroenterol. 2009 Apr 30. 9:30. [Medline]. Rawat D, Kelly DA, Milford DV, et al. Phenotypic Variation and Long-Term Outcome in Children With Congenital Hepatic Fibrosis. J Pediatr Gastroenterol Nutr. August 2013. 57 (2):161-6. [Medline]. [Guideline] Murray KF, Carithers RL Jr. AASLD practice guidelines: Evaluation of the patient for liver transplantation. Hepatology. 2005 Jun. 41(6):1407-32. [Medline]. Lai Q, Lerut J. Proposal for an algorithm for liver transplantation in Caroli's disease and syndrome: putting an uncommon effort into a common task. Clin Transplant. 2016 Jan. 30 (1):3-9. [Medline]. Biliary Atresia and Neonatal Disorders of the Bile Ducts. Robert Wyllie, Jeffrey Hyams and Marsha Kay. Pediatric Gastrointestinal and Liver Disease. Fifth Edition. Elsevier; 2016. 1172-1173. Millwala F, Segev DL, Thuluvath PJ. Caroli's disease and outcomes after liver transplantation. Liver Transpl. 2008 Jan. 14(1):11-7. [Medline]. Wang ZX, Yan LN, Li B, Zeng Y, Wen TF, Wang WT. Orthotopic liver transplantation for patients with Caroli's disease. Hepatobiliary Pancreat Dis Int. 2008 Feb. 7(1):97-100. [Medline]. Alvarez F, Bernard O, Brunelle F, et al. Congenital hepatic fibrosis in children. J Pediatr. 1981 Sep. 99(3):370-5. [Medline]. Bockhorn M, Malago M, Lang H, et al. The role of surgery in Caroli's disease. J Am Coll Surg. 2006 Jun. 202(6):928-32. [Medline]. D'Agata ID, Jonas MM, Perez-Atayde AR, Guay-Woodford LM. Combined cystic disease of the liver and kidney. Semin Liver Dis. 1994 Aug. 14(3):215-28. [Medline]. Guy F, Cognet F, Dranssart M, et al. Caroli's disease: magnetic resonance imaging features. Eur Radiol. 2002 Nov. 12(11):2730-6. [Medline]. Habib S, Shakil O, Couto OF, et al. Caroli's disease and orthotopic liver transplantation. Liver Transpl. 2006 Mar. 12(3):416-21. [Medline]. Hunter FM, Akdamar K, Sparks RD, et al. Congenital dilation of the intrahepatic bile ducts. Am J Med. 1966 Feb. 40(2):188-94. [Medline]. Ibraghimov-Beskrovnaya O, Bukanov N. Polycystic kidney diseases: from molecular discoveries to targeted therapeutic strategies. Cell Mol Life Sci. 2008 Feb. 65(4):605-19. [Medline]. Kassahun WT, Kahn T, Wittekind C, et al. Caroli's disease: liver resection and liver transplantation. Experience in 33 patients. Surgery. 2005 Nov. 138(5):888-98. [Medline]. Lacy CF, Armstrong LL, Goldman MP. Drug Information Handbook. Available at: www.lexi.com/web. 2000-2001. [Full Text]. Madjov R, Chervenkov P, Madjova V, Balev B. Caroli's disease. Report of 5 cases and review of literature. Hepatogastroenterology. 2005 Mar-Apr. 52(62):606-9. [Medline]. Mall JC, Ghahremani GG, Boyer JL. Caroli's disease associated with congenital hepatic fibrosis and renal tubular ectasia. A case report. Gastroenterology. 1974 May. 66(5):1029-35. [Medline]. Miller WJ, Sechtin AG, Campbell WL, Pieters PC. Imaging findings in Caroli's disease. AJR Am J Roentgenol. 1995 Aug. 165(2):333-7. [Medline]. Nakanuma Y, Terada T, Ohta G, Kurachi M, Matsubara F. Caroli's disease in congenital hepatic fibrosis and infantile polycystic disease. Liver. 1982 Dec. 2(4):346-54. [Medline]. Piccoli DA, Witzleben CL. Disorders of the intrahepatic bile ducts. Pediatric Gastrointestinal Disease. Philadelphia, Pa: WB Saunders Co; 2000. 1124-40. Ros E, Navarro S, Bru C, et al. Ursodeoxycholic acid treatment of primary hepatolithiasis in Caroli's syndrome. Lancet. 1993 Aug 14. 342(8868):404-6. [Medline]. Sanzen T, Harada K, Yasoshima M, et al. Polycystic kidney rat is a novel animal model of Caroli's disease associated with congenital hepatic fibrosis. Am J Pathol. 2001 May. 158(5):1605-12. [Medline]. [Full Text]. Senyuz OF, Yesildag E, Kuruoglu S, Yeker Y, Emir H. Caroli's disease in children: is it commonly misdiagnosed?. Acta Paediatr. 2005 Jan. 94(1):117-20. [Medline]. Sgro M, Rossetti S, Barozzino T, et al. Caroli's disease: prenatal diagnosis, postnatal outcome and genetic analysis. Ultrasound Obstet Gynecol. 2004 Jan. 23(1):73-6. [Medline]. Sleisenger MH, Fordtran JS, Feldman M, et al. Anatomy, anomalies, and pediatric disorders of the biliary tract. Sleisenger and Fordtran's Gastrointestinal and Liver Disease: Pathophysiology/Diagnosis/Management. WB Saunders Co; 1993. 917-927. Suchy FJ. The cholangiopathies. Sokol RJ, Balistreri WF, eds. Liver Disease in Children. Philadelphia, Pa: Lippincott Williams & Wilkins; 1994. 153-65. Summerfield JA, Nagafuchi Y, Sherlock S, et al. Hepatobiliary fibropolycystic diseases. A clinical and histological review of 51 patients. J Hepatol. 1986. 2(2):141-56. [Medline]. Caroli J, CouinaudC, SoupaultR, et al. Une affection nouvelle, sans doute cong´enitale, des voies biliaires: la dilatation cystique unilobaire des canaux h´epatiques. Sem. Sem Hop Paris. 1958. 34:134-42. Disclosure: Received consulting fee from Abbott, Inc for consulting. Disclosure: Received salary from Johnson & Johnson for employment.